Here's some simple and cute ways I came up with to incorporate empty baby food jars into your Fall decor! #1. 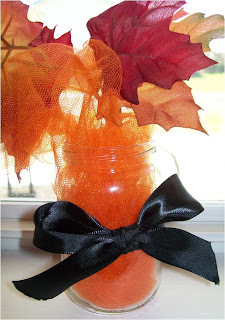 For this cute look fill and empty jar with orange tulle. Wrap a ribbon around the jar and tie into a bow. Fill with your favorite fall flowers or leaves. #2. 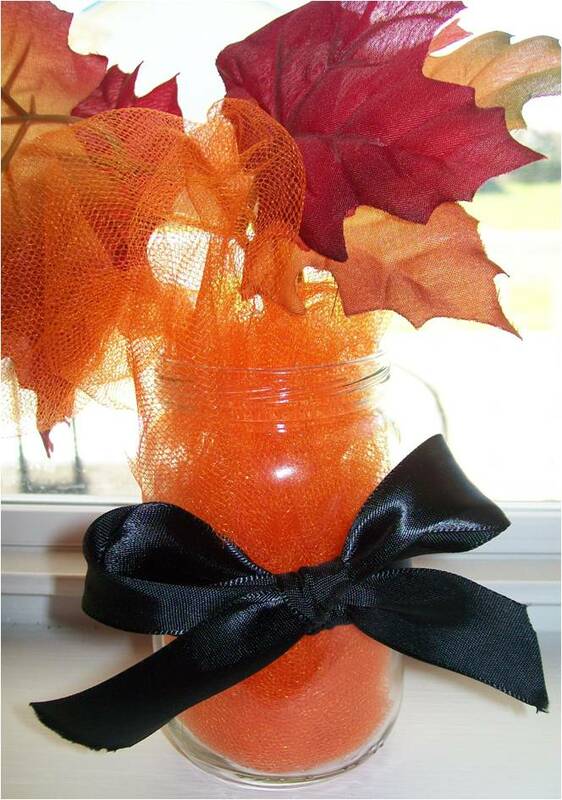 Fill the jar with your favorite Fall candy and tie a cute ribbon around. You could even paint the lid to use as well. #3. Draw a pumpkin face on the front of the jar and place a tea light candle inside to light at night. This would be cute to do with kids and let them draw their own faces. Great ideas! Love the little luminary! Love these ideas! My favorite is the first one with the orange tulle- who would have thought something so simple would be so cute! Love the tulle idea for the baby food jar. Found your site thru Train Up a Child link-up. Here is another simple and inexpensive way as well. My son loves these has had to light them every night. These are really great little craft ideas. There is so much you can do with those jars. And more st people have them stacked in their house. I know we did when we were using them. Thanks for sharing the ideas. Fun Easter Decorations with Kids. Fat shaming doctors and advocating for yourself! Puzzle Me Complete ... Wife, Mother, Teacher, Writer. Ghost Town Comes Alive at Knott's Berry Farm! I've been MIA, I'm not dead! "Step In the Name of LOVE" 2014 Breast Cancer Walk!!! Wow! I'm Such A Horrible Person! Come and visit me at my new home !! Birthday Series: The Best Chocolate Cake Recipe! Easy Way to Cut Strips of Tulle Using Only 1 Cut!